At Anglim’s Western Metal Works, we are committed to quality craftsmanship and precision in the work we do. Utilizing the most up-to-date technologies, we do what it takes to provide excellent quality and service to every one of our clients. Our shop offers the cutting-edge technology of the Omax Water- jet cutting head – the fastest, most efficient, and versatile waterjet cutting head available today. This machine utilizes high-powered jets of water to cut cleanly through metals and other materials of almost any thickness. What Makes Waterjet Cutting Superior? There are no tool and fixture changes required, allowing for a much swifter setup time. The machine can be calibrated for a variety of materials and thicknesses, providing significant flexibility. The cut edge is smooth, with no tapering and no need for additional sanding or smoothing. There is no heat, eliminating that as a cause of damage or warpage. There are no noxious gases or liquids utilized in the process. Our waterjet cutting system allows for excellent efficiency and precision. Contact us to learn more about our metal fabrication services, including water-jet cutting, and what we can do for your next metalworking project. 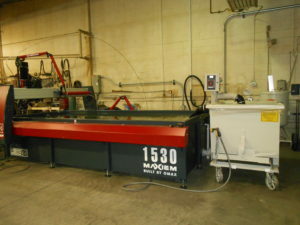 Call 505.822.9170 to learn more about our metalworking services.